#G0422* – EU Regional Assemblies – Wales, Scotland, East Midlands etc. In short that pretentious load of Eurospeak boils down to Wales will have no authority, no say, no representation & there will be 444 extra representatives to pay for in Europe. Plus, of course, all their staff and all their expenses – but no more democracy and no more control over the un elected dictator committee – the European Commissioners. 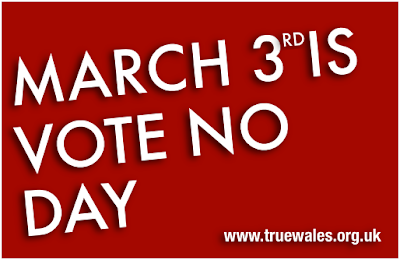 It is also worth reading Dr. Richard North’s comment on the idiotic and self destructive Referendum in Wales today 03-Mar-2011 – what was the story about the mad March hare where they squabble and fight for dominance! Did you know that there was a referendum today on whether the Welsh Assembly should be given law-making powers? The fact of the referendum, the reasons for it and the consequences, have been the object of almost total silence within the province, many people with the misfortune to live in Wales being unaware of the referendum. Is it believed that the silence is deliberate. This is a measure that even on a good day would be unpopular. The less people know of it, therefore, the more chance its self-interested supporters have of getting it through. As for the rest of the UK, although this is called devolution, it is yet another step in the dissolution of the Union – the United Kingdom, that is. That, of course, means another step towards the creation of the Europe of the Regions, part of that greater European Union. The process of regionalisation started as a parallel model for the political integration of Europe, and has since been absorbed into the mainstream. Creation of strong(er) regional entities, with direct ties to the supranational centre (Brussels) weakens the power and authority of the national government. The bizarre thing is that it does nothing to enhance democracy or local accountability. It simply adds – and in this case strengthens – yet another, more intrusive layer of government and confuses lines of responsibility and authority … which is, of course, part of the game. Anyone really interested in democracy would be pushing enhanced powers to local authorities – including genuine tax-raising powers and, indeed, law-making powers. Local authorities used to have such powers, exercised by way of by-laws, and local Acts. Many of the issues which are currently regulated by national British regulations and now EU law started off their lives as by-laws. No longer can such a degree of local autonomy be permitted by our masters. In the Orwellian world of the Perfect Union, devolution means more centralisation. More “democracy” means less democracy. That is what was always intended to be, even if there are some people stupid enough to believe otherwise. That is why those who are aware of the referendum and who understand what it is really about will be voting “no” today. Next Next post: #G0423* – SCHOOL HAS CHANGED With POLITICAL CORRECTNESS!